Shutts & Bowen is pleased to announce that attorneys Meredith Freeman and Dana Chaaban have been selected for the Leadership Council on Legal Diversity (LCLD) 2019 class of Fellows and Pathfinders, respectively. Miami associate Dana Chaaban will represent the firm as a member of the 2019 class of Pathfinders. This program is designed by LCLD to train high-performing, early-career attorneys in critical development strategies including leadership and the building of professional networks. The program offers intensive in-person training, online experiential learning, and opportunities to network with peers and esteemed LCLD Fellows in small group gatherings. 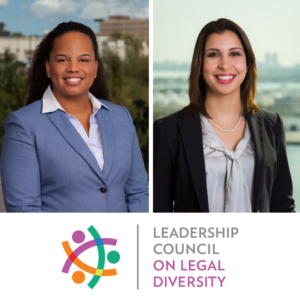 Founded in 2009, LCLD is a growing organization of more than 300 corporate chief legal officers and law firm managing partners who are personally committed to creating a more diverse and inclusive legal profession. To learn more about each of the programs, please visit www.lcldnet.org. Meredith A. Freeman is a partner in the Tampa office of Shutts & Bowen LLP, where she is a member of the Construction Litigation Practice Group. Meredith is Board Certified in Construction Law by the Florida Bar and practices primarily in the areas of construction and business litigation. Meredith has experience in handling a variety of construction related matters, including claims against design professionals, construction defects claims, and delay claims. Meredith is also experienced in drafting and negotiating construction contracts. Dana Chaaban is an attorney in the Miami office of Shutts & Bowen LLP, where she is a member of the Construction Litigation Practice Group. Dana focuses her practice on commercial, construction and insurance litigation. She represents developers, contractors, material suppliers, design professionals and carriers in disputes involving construction defect claims, delay claims, construction lien and insurance issues, and contract disputes.